This delicious stew was accompanied by one of my biggest cooking fails. Ever. I’ve had this recipe on my “to-cook” list forever. I was inspired by a local restaurant, Buraka. They have to-die-for peanut stew and they serve it with really, really great injera. For those of you who haven’t had injera, it’s an Ethiopian flatbread that has a spongy texture and a bit of a tang. Like a cross between a pancake, crepe and… sourdough bread? I’m not sure how to explain it, but it’s awesome. Sadly, Buraka was forced to close at the end of October. The building it was in is being torn down and turned into another residential building. Sigh. To make it worse, two more of my fave Madison restaurants were also displaced because of this – Husnu’s and Kabul. This closing meant the end of any peanut stew and injera deliciousness. So, I set off to recreate it. I was partly successful. The stew was pretty good. The injera? A total fail. As in – the smell and taste of it made me want to curl up into a ball and die. 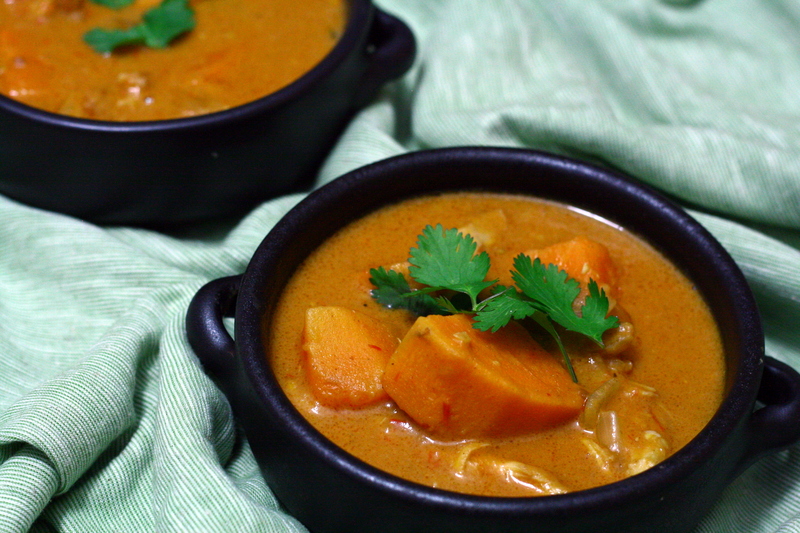 I obviously won’t be sharing the injera recipe with you today (or ever – I don’t think I’ll attempt it again), but I do have the chicken peanut stew for you. Heat oil in a large pot over medium-high heat. Salt chicken pieces and, working in batches, brown them in the oil. It’s important that you don’t overcrowd the pot. Set the browned chicken aside. In the pot, saute the onions for 3 – 4 minutes, scraping the browned pieces off the bottom of the pot as you cook. Add in the ginger and garlic and saute for another minute. Add in sweet potatoes, chicken broth, tomatoes, peanut butter, peanuts, coriander and cayenne and stir well to combine. Taste the sauce, and adjust seasoning with salt and pepper as needed. Place chicken pieces into the pot and bring to a simmer. Cover and let cook for about an hour, or until the chicken is fully cooked and sweet potatoes are tender. Remove chicken pieces to a bowl and let cool slightly. When cool enough to handle, shred the chicken and place back into the pot. Stir in cilantro and serve hot with rice. Categories: Chicken, Dairy Free, Gluten Free, Main Entrees, Meat, Soups, Stews & Chili, Special Diets | Tags: chicken, dairy free, gluten free, main entree, soup, stew | Permalink.